In 1939, Kanavel, author of the landmark Infections of the Hand, observed, "In almost all cases of serious infection the difficulty is to make a correct diagnosis both as to the nature of the infection and the position of the pus." Specific infections covered in this article include paronychia, felon, herpetic whitlow, tenosynovitis, and deep fascial space infections. See the image below. Few structures of the body are as complex or as unique as the human hand with the functions of sensation, mobility, and strength in one small area. The hand consists of multiple compartments and planes, the knowledge of which allows one to understand the pathophysiology, diagnosis, and treatment of hand infections. 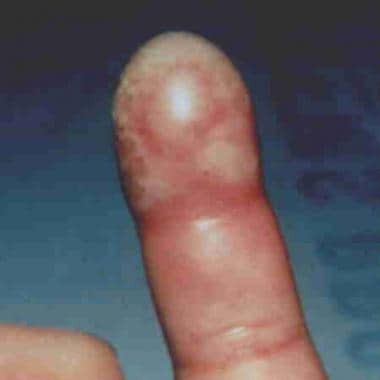 Infection of the area of the lateral nail fold (paronychium) is typically due to superficial trauma (eg, hangnails, nail biting, manicuring, finger sucking). Artificial nails have also been associated with acute paronychia. Although paronychia typically starts as a cellulitis, its progression to abscess formation is not uncommon. Infection that spreads to the proximal nail edge is termed an eponychia. 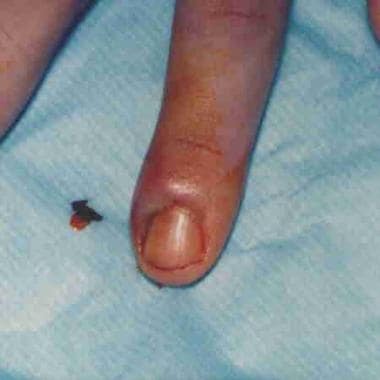 Occasionally, infection can spread under the nail plate itself, resulting in a subungual abscess. Chronic paronychia resembles acute paronychia but is usually nonsuppurative. People at risk include those repeatedly exposed to water and/or irritants as well as those who are immunocompromised. Metastatic cancer, subungual melanoma, and squamous cell cancer may rarely present as chronic paronychia. The distal palmar phalanx is compartmentalized by tangentially oriented fibrous septa. These septa result in a closed compartment at the distal phalanx, which helps prevent the proximal spread of infection. Infection is typically due to direct inoculation of bacteria by penetrating trauma but may be caused by hematogenous spread and by local spread from an untreated paronychia. Herpes simplex virus (HSV) infection of the distal finger typically results from direct inoculation of the virus into broken skin. Type 1 and type 2 HSV infections are clinically indistinguishable. As in herpes infections elsewhere in the body, it is believed that the virus can remain dormant in the neural ganglia, leading to recurrent infections. See the image below. A herpetic whitlow. Image courtesy of Glen Vaughn, MD. Tendon sheaths consist of a visceral layer adherent to the tendon and a parietal layer. Notably, the flexor tendon sheath of the thumb is continuous with the radial bursae, whereas the flexor tendon sheath of the fifth digit is continuous with the ulnar bursae. In 80% of individuals, communication exists between the radial and ulnar bursae. The tenosynovial coverings of the second, third, and fourth digits do not communicate with either the radial bursae or the ulnar bursae in most individuals. Infection within a flexor tendon sheath, as in other infections of the hand, usually is the result of direct inoculation of bacteria from penetrating trauma. One common cause of penetrating trauma occurs when one person strikes another person in the mouth, resulting in a fight bite. A tooth may penetrate the metacarpophalangeal (MCP) joint capsule or an extensor tendon. Because the injury occurs while the joint is in flexion, deeper injuries to the extensor tendon or the MCP joint capsule or bone can be easily missed when the hand is examined in extension. For more information, see Bites, Human. Infection can also occur by hematogenous spread, with Neisseria gonorrhoeae as the offending agent in many cases. Pyogenic flexor tenosynovitis, an infection of the flexor tendon, is most common in the index, middle, and ring fingers and can form as early as 6 hours after the initial penetration. Infection typically follows the course of the tendon sheath, which results in the spread of infection into the radial or ulnar bursae, depending on the primary tendon sheath involved. Elevated pressure within the tendon sheath due to infection may impair nutrient flow to the tendon. Tendon necrosis, impaired function, or both are disastrous sequelae of untreated elevated tendon sheath pressure. The deep fascial spaces of the hand are potential spaces and consist of the dorsal subaponeurotic space, subfascial web space, midpalmar space, and thenar space. The dorsal subaponeurotic space lies volar (or deep) to the extensor tendons of the hand. The subfascial web space is contiguous with the dorsal subcutaneous space of the digits. The midpalmar space is demarcated by the palmar interosseous muscles dorsally and the flexor tendons of the third, fourth, and fifth digits ventrally. Lastly, the thenar space extends from the long metacarpal bone to the thenar eminence and consists of the area between the adductor pollicis muscle dorsally and the flexor tendon of the second digit ventrally. These compartments are susceptible to infection by direct penetrating trauma, spread from a neighboring compartment, or hematogenous seeding. Because of the dorsal location of the lymphatics, erythema and swelling commonly appear over the dorsum of the hand, even when the injury is of palmar origin. For more on hand anatomy, see Hand, Anatomy. Infections of the hand (especially dominant-hand infections) can be devastating and frequently require admission for antibiotic therapy and/or surgical intervention. Possible complications are outlined below (see Complications). Most resolve in 2-4 days. Chronic infections are likely fungal infections and are typically more difficult to treat. The prognosis is good, with healing in 1-2 weeks. Infection usually resolves in 2-4 weeks. Recurrence is not uncommon because virus may lay dormant in neural ganglia. These have a fair prognosis, depending on the extent of tissue destruction, bony involvement, preexisting vascular insufficiency, and systemic complications (eg, bacteremia, sepsis). Instruct patients on proper wound care including warm soaks, if indicated, and dressing changes. Inform patients of the signs and/or symptoms of worsening infection, including increased pain, edema, redness, warmth, or fever. Emphasize the importance of follow-up care and wound reevaluation with the primary medical doctor or the ED physician. For excellent patient education resources, visit eMedicineHealth's Infections Center. Also, see eMedicineHealth's patient education articles Paronychia (Nail Infection), Finger Infection, Hand Injuries, and Finger Injuries. Kanavel AB. Infections of the Hand. 1939. 17-410. Ong YS, Levin LS. Hand infections. Plast Reconstr Surg. 2009 Oct. 124(4):225e-233e. [Medline]. Pintor E, Montilla P, Catalán P, Burillo A, Gargantilla P, Herreros B. Recurrent infection in the left thumb. Infection. 2013 May 7. [Medline]. Ergun A, Toprak R, Sisman FN. Impact of a Healthy Nails Program on Nail-Biting in Turkish Schoolchildren: A Controlled Pretest-Posttest Study. J Sch Nurs. 2013 Mar 14. [Medline]. Marvel BA, Budhram GR. Bedside ultrasound in the diagnosis of complex hand infections: a case series. J Emerg Med. 2015 Jan. 48 (1):63-8. [Medline]. Blaivas M, Lyon M, Brannam L, Duggal S, Sierzenski P. Water bath evaluation technique for emergency ultrasound of painful superficial structures. Am J Emerg Med. 2004 Nov. 22 (7):589-93. [Medline]. Betz D, Fane K. Herpetic Whitlow. 2018 Jan. [Medline]. [Full Text]. Schwandt NW, Mjos DP, Lubow RM. Acyclovir and the treatment of herpetic whitlow. Oral Surg Oral Med Oral Pathol. 1987 Aug. 64 (2):255-8. [Medline]. [Guideline] Hand hygiene recommendations. In: Betsy Lehman Center for Patient Safety and Medical Error Reduction, JSI Research and Training Institute, Inc. Prevention and control of healthcare-associated infections in Massachusetts. Part 1: final recommendations of the Expert Panel. Boston (MA): Massachusetts Department of Public Health; 2008 Jan 31. [Full Text]. Bach HG, Steffin B, Chhadia AM, Kovachevich R, Gonzalez MH. Community-associated methicillin-resistant Staphylococcus aureus hand infections in an urban setting. J Hand Surg [Am]. 2007 Mar. 32(3):380-3. [Medline]. Wilson PC, Rinker B. The incidence of methicillin-resistant staphylococcus aureus in community-acquired hand infections. Ann Plast Surg. 2009 May. 62(5):513-6. [Medline]. Antosia RE, Lyn E. Hand. Rosen, ed. Emergency Medicine Concepts and Clinical Practice. 5th ed. 2002. 493-535. Butler, KH. Incision and drainage. Roberts JR, Hedges JR, eds. Clinical Procedures in Emergency Medicine. 4th ed. 2004. 739-744. Gill MJ, Arlette J, Buchan K. Herpes simplex virus infection of the hand. A profile of 79 cases. Am J Med. 1988 Jan. 84(1):89-93. [Medline]. Goldstein EJ, Barones MF, Miller TA. Eikenella corrodens in hand infections. J Hand Surg [Am]. 1983 Sep. 8(5 Pt 1):563-7. [Medline]. Hausman MR, Lisser SP. Hand infections. Orthop Clin North Am. 1992 Jan. 23(1):171-85. [Medline]. Siegel DB, Gelberman RH. Infections of the hand. Orthop Clin North Am. 1988 Oct. 19(4):779-89. [Medline]. Talan DA, Citron DM, Abrahamian FM, Moran GJ, Goldstein EJ. Bacteriologic analysis of infected dog and cat bites. Emergency Medicine Animal Bite Infection Study Group. N Engl J Med. 1999 Jan 14. 340(2):85-92. [Medline]. Wolanyk DE. 17. Infections. Hart RG, Uehara DT, Wagner MJ, eds. Emergency and Primary Care of the Hand. Irving,Tx: The American College of Emergency Physicians; 2001. 219-246. Miller LG, Daum RS, Creech CB, Young D, Downing MD, Eells SJ, et al. Clindamycin versus trimethoprim-sulfamethoxazole for uncomplicated skin infections. N Engl J Med. 2015 Mar 19. 372 (12):1093-103. [Medline]. Wilson PC, Rinker B. The incidence of methicillin-resistant staphylococcus aureus in community-acquired hand infections. Ann Plast Surg. 2009 May. 62 (5):513-6. [Medline]. The authors and editors of Medscape Reference gratefully acknowledge the contributions of previous authors, Amy K Rontal, MD, and Heatherlee Bailey, MD, to the development and writing of this article.